It is the first of the semi-finals, when one team find out if they have made it to the grand final of the quiz for students. Jeremy Paxman asks the questions. It is the first of the semi-finals and one team find out if they have made it to the grand final of the quiz for students. Jeremy Paxman asks the questions. It is the last of the quarter-finals and one more team will make it through to the semi-final stage of the quiz for students. Jeremy Paxman asks the questions. The pressure is increasing as the quarter-finals continue. Which team will make it to the next stage of the quiz for students? Jeremy Paxman asks the questions. The gruelling quarter-finals continue as two student teams vie to reach the next stage of the competition. Jeremy Paxman asks the questions. In another quarter final match two teams of students aim to reach the next stage of the quiz. Jeremy Paxman asks the questions. In another quarter-final match, find out which university team will make it to the next stage of the quiz for students. Jeremy Paxman asks the questions. The quarter-finals continue as two teams of university students do battle to reach the next stage in the competition. Jeremy Paxman asks the questions. In the last of the second-round matches, students representing two more universities battle it out for a place in the quarter-finals. Jeremy Paxman asks the questions. 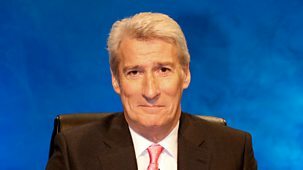 The second round of the quiz for students continues as two teams representing their universities aim to reach the quarter-finals.\n\nJeremy Paxman asks the questions. In the last of the semi-finals, find out which team succeeds in achieving a place in the grand final of the quiz for students. Jeremy Paxman asks the questions. In the opening match of the quiz series for students the University of Warwick takes on Exeter University for a place in the second round. Jeremy Paxman asks the questions. The second round of the quiz for students continues when two teams representing their universities aim to reach the quarter-finals. Jeremy Paxman asks the questions. 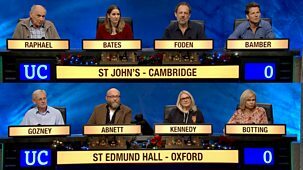 In the opening match of the quiz series for students Glasgow University takes on Peterhouse, Cambridge, for a place in the second round. Jeremy Paxman asks the questions.